The Sacrament of Reconciliation will be available throughout Holy Week. In addition to our Communal Penance Service on Tuesday, April 16, when more than a dozen confessors will be available in multiple languages, we offer daytime confessions with several priests each day. St. Matthew’s Cathedral Parish has joined with 800 Catholic communities, organizations, and institutions in the United States to declare that “We are still in” on actions that meet the climate goals outlined in the Paris Agreement. Many other state, tribal, and local governments, as well as businesses, financial institutions, and other faith organizations have made a similar pledge. As the Church continues to minister to all survivors of abuse, the Archdiocese of Washington is sponsoring retreats for survivors. The Archdiocese will offer a men’s retreat on April 5 – 7 and a women’s retreat on April 12 – 14 for survivors. These retreats are an occasion for survivors to reflect on God’s plan for their lives and for healing through prayer and the sacraments. View the flier. 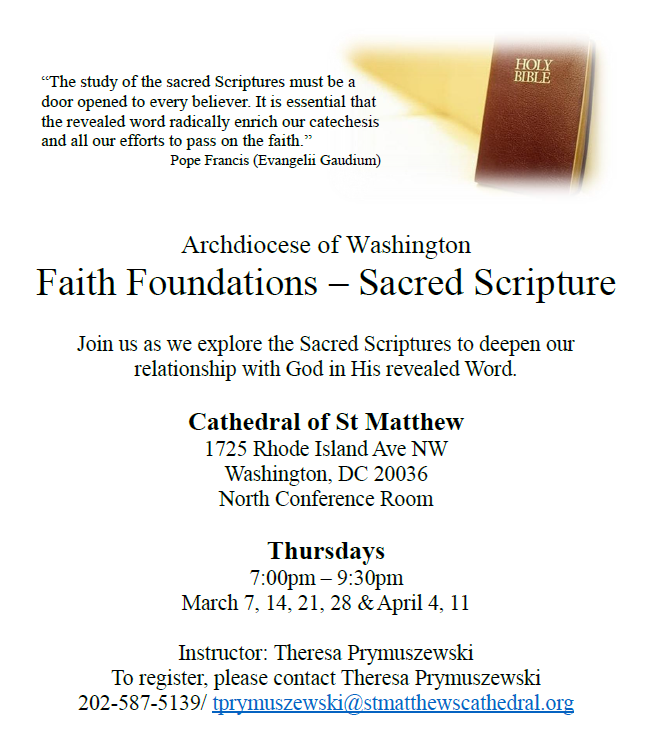 Come and deepen your understanding of sacred Scripture, guided by Theresa Prymuszewski, on Thursdays of Lent, weekly from March 7 through April 11, in the North Conference Room from 6:30 to 9pm. View the flier. The annual jubilarian celebration of marriage honoring couples married 25, 30, 35, 40,45, 50 and 50+ years will be held Sunday, June 23, 2019 at 2pm, at the Basilica of the National Shrine of the Immaculate Conception. To register, call the rectory at 202-347-3215 by Tuesday, April 23. Looking for a quick and easy way to learn more about your faith and meet other young adults at the Cathedral? Join us in the West Conference Room after the 5:30pm Sunday Mass for Cathedral Coffeehouse with Fr. Conrad Murphy and the Cathedral Young Adults. The Homeless Ministry needs additional volunteers to provide donations of breakfast food for the poor and homeless who visit our parish on Monday mornings for breakfast, Bible study, a bagged lunch, and toiletries. All are welcome to attend our monthly committee meetings to learn more about service opportunities and upcoming events. Help us with planning and organizing activities that assist those in need and engage us to live the Gospel message. Read more about Join the Social Justice Committee! Did you notice more times of silence in the liturgy at St. Matthew's this past weekend ? Find out what's behind these deliberate periods of reflective silence - Deacon Bart Merella enlightens us with an explanation! VIEW THE Easter Mass schedule. Holy Week & Easter schedule. VIEW The English Lenten brochure. VEA el folleto de Cuaresma en español.